Born in 1880, Helen Keller lived to see an oppressed working class transformed into a growing and prosperous middle class, particularly in the decades following the advent of President Franklin Roosevelt's New Deal programs. Keller did not live to see the tragedy wrought by the introduction of supply-side, trickle-down economics by President Ronald Reagan. Our country is once again "governed for the richest, for the corporations, the bankers." The middle class and the American Dream are under threat. The defining economic issue of our time is reestablishing the equal sharing of income growth across all income levels that characterized the decades between Roosevelt and Reagan. can you tell us why Helen Keller took this picture or where??? GIve Us Some Detail please!! 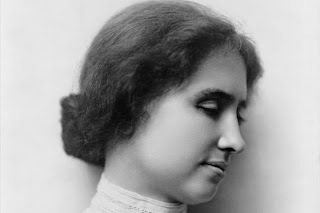 The only additional information I have on this particular portrait is that it was taken in 1904 when Helen Keller was about 24, the same year that Keller graduated from Radcliffe, becoming the first deaf blind person to earn a Bachelor of Arts degree.